The ottoman continues the flow of the Baldwin Chair and Lawn Chair. When your feet are elevated your blood can flow much easier. This will make your feet feel better. The arch in the ottoman is the result of much exhausting research. 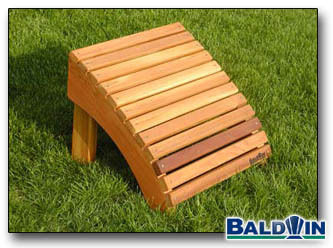 It gives just the right amount of pressure to your calf muscles that makes them totaly comfortable and relaxed.